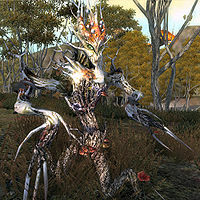 This article provides an overview of the new creatures added by Shivering Isles. Details about each creature type are provided on individual pages dedicated to each creature variety (see links provided in the article). 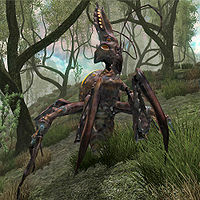 Creatures found in the Shivering Isles that are also seen without the expansion pack are documented at the Oblivion article on creatures. 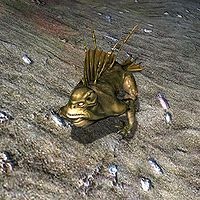 Several enemies encountered in the Shivering Isles are actually NPCs, not creatures. In particular see Forces of Order, Golden Saint and Dark Seducer. * These are leveled creatures that grow stronger with the player. Only the second Gatekeeper does however. Baliwogs are commonly found near or in water. They regenerate health when swimming. Has a 15% chance of being inflicted by Swamp Fever. Variations: Young Baliwog, Venemous Baliwog. The Elytra are large insect-like creatures indigenous to much of the Isles. Apart from a slightly different appearance, the Mania variety and the Dementia variety are the same. Resists Poison and is vulnerable to Magic. Variations: Elytra Hatchling, Elytra Drone, Elytra Soldier, Elytra Noble, Elytra Matron. The Gnarl has the most unusual trait of being able to use magic cast upon it, and harness that power to bolster its own defense. Apart from a slightly different appearance, the Mania and Dementia varieties are the same. Variations: Germinal Gnarl, Gnarl Sapling, Gnarl Rootbender, Verdant Gnarl, Gnarl Elder. 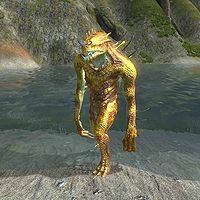 Grummites can be found all over the Shivering Isles. They appear in different forms and with different weapons. Grummites regenerate health when it is raining or when they are swimming. Found: Everywhere in the Shivering Isles, mostly in ruins. Drops: Madness Ore, various loot. Resists Frost and is vulnerable to Fire. 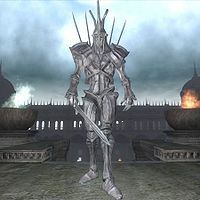 Variations: Grummite Whelp, Grummite Magus Whelp, Grummite Beater, Grummite Magus Beater, Grummite Torturer, Grummite Magus Torturer, Grummite Painbringer, Grummite Magus Painbringer, Grummite Deathdealer, Grummite Magus Deathdealer. Scalons are commonly found near water, occasionally leaping from the water and attacking. They have the ability to become invisible, which they often use prior to attacking. Has a 25% chance of being inflicted with a disease. Variations: Diseased Scalon, Scalon Brute, Hulking Scalon. The Shambles appears to be some sort of undead construct made of bone and lashed together with wire or bits of cloth. When Shambles die, they trigger an area-effect Frost Damage effect. Resists Frost and is immune to Poison and Paralyze. Variations: Decrepit Shambles, Replete Shambles, Complete Shambles. 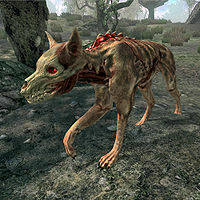 Skinned Hounds, apart from their unusual appearance, have no special abilities or attacks. They are often found accompanying other undead creatures. Resists Frost and Magic, immune to Poison and vulnerable to Fire. 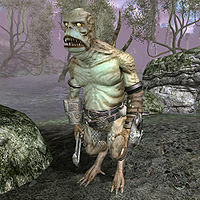 Variations: Greater Skinned Hound, Ushnar's Skinned Hound. 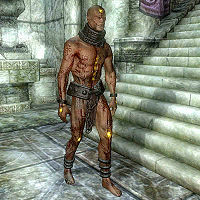 The Flesh Atronach appears as a sewn-together conglomeration of skin and muscle adorned with mystical symbols and wearing an iron collar. 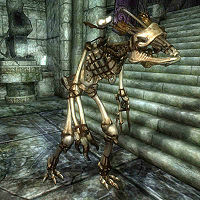 They are commonly found in ruins with undead creatures. Flesh Atronachs are also summoned by Zealots to fight for them. Their appearance bears a resemblance to the Gatekeeper (albeit on a smaller scale). They previously appeared in Daggerfall. Immune to Poison, has Stunted Magicka and has various resistances against Magicka. 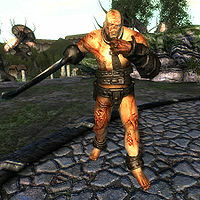 Variations: Mangled Flesh Atronach, Torn Flesh Atronach, Stitched Flesh Atronach, Sewn Flesh Atronach, Mended Flesh Atronach, Failed Experiment. 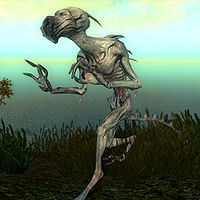 These thin-skinned Daedra were previously seen in Morrowind, and serve the Daedric Prince Boethiah. They can be found all over the Shivering Isles. Heretics are known to summon Hungers. Found: Everywhere in the Shivering Isles. Resists Fire and is vulnerable to Shock. Variations: Starved Hunger, Gluttonous Hunger, Ravenous Hunger, Voracious Hunger. This page was last modified on 5 December 2018, at 14:53.